Numbers 20:13 These are the waters of Meribah; because the children of Israel strove with Yahweh, and he was sanctified in them. Numbers 20:24 "Aaron shall be gathered to his people; for he shall not enter into the land which I have given to the children of Israel, because you rebelled against my word at the waters of Meribah. mas'-a, mer'-i-ba (maccah umeribhah, "proving and strife"; peirasmos kai loidoresis): These names occur together as applied to one place only in Exodus 17:7; they stand, however, in parallelism in Deuteronomy 33:8 Psalm 95:8. In all other cases they are kept distinct, as belonging to two separate narratives. The conjunction here may be due to conflation of the sources. Of course, it is not impossible that, for the reason stated, the double name was given, although elsewhere (Deuteronomy 6:16; Deuteronomy 9:22) the place is referred to as Massah. This scene is laid in Exodus 17:1 at REPHIDIM (which see) and in 17:6 at HOREB (which see). It is near the beginning of the desert wanderings. In dearth of water the people murmur and complain. Moses, appealing to God, is told what to do. He takes with him the elders of Israel, and smites with his rod the rock on which the Lord stands in Horeb, whereupon water gushes forth, and the people drink. Here Moses alone is God's agent. There is no hint of blame attaching to him. He called the place Massah and Meribah, because of the of the striving of the children of Israel, and because they tempted the Lord (17:7). In some way not indicated, here and at Meribah, God put the Levites to proof (Deuteronomy 33:8). The second narrative describes what took place at Kadesh (i.e. 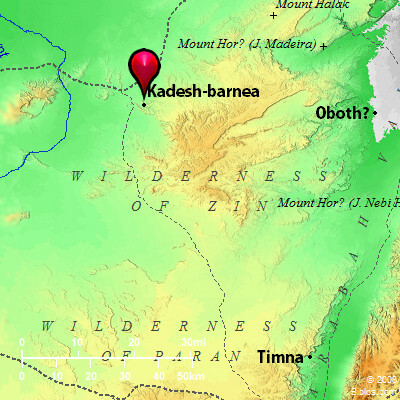 "Kadesh-barnea") when the desert wanderings were nearly over (Numbers 20:1-13). The flow of water from the famous spring for some reason had ceased. In their distress the people became impatient and petulant. At the door of the tent of meeting Moses and Aaron received the Lord's instructions. In his speech of remonstrance to the people Moses seemed to glorify himself and his brother; and instead of speaking to the rock as God had commanded, he struck it twice with his rod. The flow of water was at once restored; but Moses and Aaron were heavily punished because they did not sanctify God in the eyes of the children of Israel. The "Waters of Meribah" was the name given to this scene of strife. The incident is referred to in Numbers 20:24, and Deuteronomy 32:51 (merobhath qadhesh, the King James Version "Meribah-Kadesh," the Revised Version (British and American) "Meribah of Kadesh"). In Psalm 81:7 God appears as having tested Israel here. The sin of Israel and the ensuing calamity to Moses are alluded to in Psalm 106:32. The place appears in Ezekiel 47:19; Ezekiel 48:28, as on the southern border of the land of Israel, in the former as "Meriboth-kadesh," in the latter as "Meribath-kadesh" (Meriboth = plural Meribath = "construct singular") where the position indicated is that of `Ain Qadis, "Kadesh-barnea." In Deuteronomy 33:2, by a slight emendation of the text we might read meribhoth qadhesh for meribhebhoth qodhesh. This gives a preferable sense.